This pack contains 3 propagators, each holding 30 plants so you can grow on up to 90 plants. Supplied as a pack of 3 complete window propagator kits. Made from durable plastic. 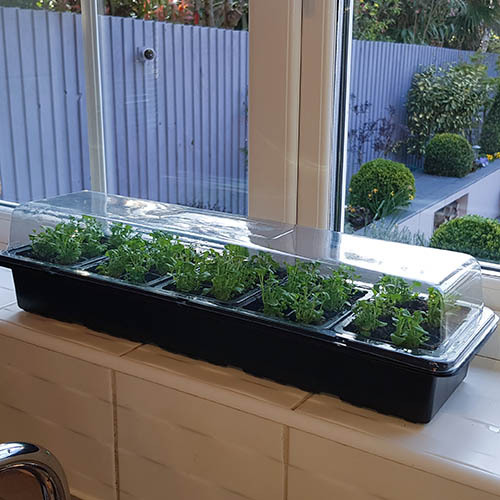 These windowsill propagators provide the perfect environment to grow on plugs and seedlings before you plant them out into your garden. Shaped to fit onto any windowsill so now even those with the absolute minimum of space can grow on their own plants. Each propagator acts like a miniature greenhouse giving plants warmth and light when potted. Once established, take off the lid to toughen up the plants before planting.